We're happy to share that we're now on Facebook! Like us here to keep up with what's new at Grimshaw Chiropractic Care Centre. Myoskeletal alignment focuses on treating stubborn painful conditions by massaging tight muscles to mobilize restricted joints. Muscles that are tight and stressed contribute to pain by limiting motion. Weak muscles don't provide enough support for the body. Poor muscle function leads to postural problems, stiffness and other symptoms that create a cycle of endless pain. Myoskeletal alignment technique reduces pain and discomfort by helping improve the alignment of the body. 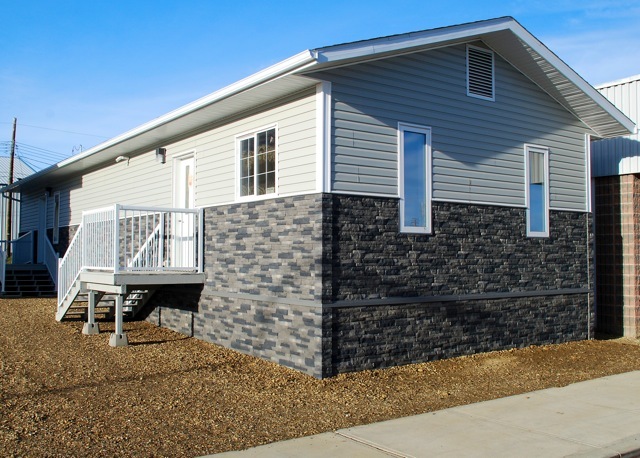 To book an appointment please call us at 780-332-2700. When you trip or stumble, your body quickly tries to restore balance so that you do not fall. The part of your brain that plays a major role in helping you to stay upright is called your cerebellum. The cerebellum is a small region of your brain that has three major functions: muscle tone, balance, and movement co-ordination. The cerebellum is one of the three components of your brain. There are exercises to activate your brain or cerebellum. Simple activities like balancing on one foot with your eyes closed will help make your cerebellum work better. Coordinated hand and foot movement also helps, as well as activities such as bouncing a ball to playing the piano. If you want more detailed or precise exercises on how to improve your nervous system function, feel free to come down to Grimshaw Chiropractic. Are you dealing with chronic pain? Does nothing seem to be helping? Myofascial Release might be the right therapy for you! This technique releases the fascial system - a three-dimensional web that connects and surrounds every muscle, organ, cell and system in the body. Myofascial release is a safe and effective therapy that involves applying gentle, sustained pressure into the Myofascial connective tissue restrictions to eliminate pain and restore motion. This gentle pressure applied slowly will allow the fascia to elongate and rehydrate. Anything from trauma, inflammation, surgical procedures or posture, etc. can create restrictions that can dehydrate the tissues and produce pressure on pain sensitive structures. These restrictions produce symptoms of decreased range of motion, limited flexibility, weakness pain, etc. Myofascial Release treats the entire body eliminating the restrictions that causes the symptoms, helping to restore balance. Releasing the fascial restrictions throughout the body will decrease the pressure on the tissues, therefore decreasing pain and increasing function, blood flow and overall health. Ask us how Myofascial Release Therapy can benefit you and call us to book an appointment at 780-332-2700. 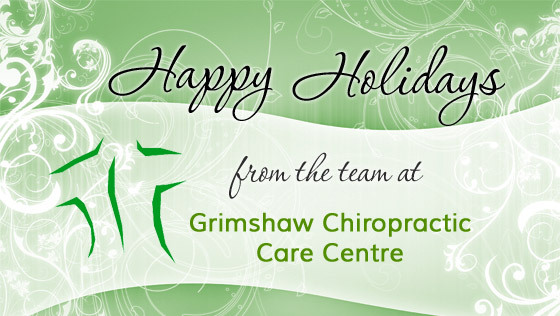 Grimshaw Chiropractic Care Centre would like to take this time to thank you for all your patronage and support. We hope that we have encouraged you to improve your health in the last year, and that we can be of continued service in the New Year. May the holiday season bring good health and happiness to you and your loved ones. Merry Christmas and Best Wishes in the New Year from your Health Team at the Grimshaw Chiropractic Centre! - Dr. Jennifer Adams-Hessel, Dr. Brett Hessel, Veronica Lambert, Angie Weaver and Kalyn Schargenberg. We are excited to announce that Veronica Lambert has joined us at Grimshaw Chiropractic Care Centre as a registered massage therapist. Veronica was born and raised in Peace River and graduated from the Alberta Massage Training in Grande Prairie in July of 2013. 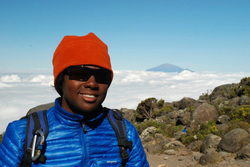 She loves helping people through their healing journey so she feels massage therapy is more of a calling than a job. Veronica approaches the body as a whole during her treatments by determining where the primary discomfort is originating from and working towards correcting it. She plans to continue her education so she can incorporate other modalities into treatments to created added benefit for her clients. She currently offers therapeutic massage, Swedish massage and Reiki. Veronica has just returned from training in myofascial therapy in Miami, Florida and looks forward to incorporating aspects of this new technique to her massage practice. After 13 years at our old location we have finally moved to a bigger location at 5016 - 54th Avenue, located across the street from the Super A Grocery Store. The new building offers more space and allows us to expand our services to include massage therapy. Being part of a team of very knowledgeable professionals. Appreciate the relaxed atmosphere at Grimshaw Chiropractic, does not feel like I am going to work.